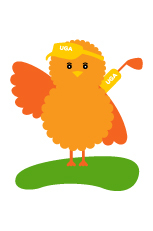 UGA teaches students the proper skills, rules, and etiquette of golf in both indoor and outdoor settings. Our classes are designed to empower children both on and off the course while cultivating a love for the game of golf. Our unique program lets children explore the game of golf in a safe, secure, and nurturing environment. We use a variety of specially designed equipment, including the Littlest Golfer, SNAG, ShortGolf, Birdie Ball, and USKG clubs to focus on skill development while having FUN. No matter what level your child is at we take pride in our holistic approach to golf skill development. Please note: Age ranges for different levels are guidelines only. Children learn in different ways and at difference paces and we honor these differences. All classes have a low student to coach ratio to ensure that proper individual attention is provided to each student. In the Early Birdies classes students discover and explore while we introduce the game of golf in an environment that is dynamic and child-centered. Our Early Birdies cultivate their excitement for the game while developing the necessary physical and golf-specific skills that enhance their enjoyment of the sport. Early Birdies classes are 50 minutes long and are filled with fun, golf-focused activities that capture students’ interest and keep them coming back for more. Through our emphasis of PLAYful learning, we engage and motivate children in ways that enhance developmental outcomes and life-long learning. Children can and are encouraged to repeat this program several times. For young children, repetition is essential to acquire the skills for success. Each lesson in our program has clear learning objectives and is fun, fresh, and engaging. Every session includes time to reflect on what students have learned. Our Birdies classes are geared toward children at least 5 years of age. These classes are 60 minutes long and build upon, extend and enrich the fundamental golf and movement skills, and methodologies taught in the Early Birdies classes. We continue to nurture students’ love for golf and delve deeper into key concepts including pre-shot routine, scoring, club selection and course management. These classes include activities and exercises that reinforce and challenge students’ developing skills. Students are encouraged to internalize their progress and make connections, as well as develop confidence in what they are doing. Of course we do all of this while maintaining our mantra of FUN. This program is for students ages 7 and up. It is 90 minutes long and held at Premier Indoor Golf that allows developing students to take their skills to the next level. The program provides a wonderful way to extend and enrich the fundamental golf and movement skills, and methodologies taught in the Early Birdies and Birdies classes. We continue to nurture students’ love for golf and delve deeper into key concepts including pre-shot routine, scoring, club selection and course management. These classes include activities and exercises that reinforce and challenge students’ developing skills. Students benefit from the extended class time at Premier and the use of their 4 golf simulators. This program is run only during the summer season at Montauk Downs. As soon as we find a good location to host Green Saturdays and the league again, students will enjoy a 3-hour group-playing session. Whether you are a beginner or a single-digit handicapper, a 5-year old or an 85-year old, UGA is here to help you improve your game. When pre-approved by the locations, we conduct private lessons in season at area golf facilities (Marine Park Golf Course, Mosholu, Flushing Meadows, Dunwoodie Golf Course and Montauk Downs Golf Course). We provide private lessons all year long at Premier Indoor Golf in NYC. What better way to spend time with your child than taking a golf lesson together? In these sessions, parents observe our safe, simple, successful techniques to teach children important golf concepts such as set-up, posture, balance, tempo and finish. By practicing alongside your child, two important things happen: your technique shifts (sometimes slightly and sometimes with a big “AHA”) and you learn useful ways to help your junior golfer. Before the first lesson, one of our coaches will contact you to understand you and your child’s skill levels and recommend which clubs to bring to your lesson. You will walk away with games and metaphors you can use to reinforce your childs learning and will keep them PLAYing golf. UGA started in a 950 sq ft room. It wasn’t until two years later it was brought outside into the expanse of Central Park. Indoor settings provide a multitude of teachable moments and throughout the UGA program children are swinging into “shadow screens”, chipping through hula hoops, putting down the “train tracks” laid out with masking tape, and, most importantly, using their creativity and imagination to enjoy golf.